The countdown just keeps getting shorter and shorter! TWO days left now until Roaring Forties Press publishes Rome's Angels & Demons: an Insider's Guide -- a free ebook with inside information about the art and places in Dan Brown's book. And you will be able to get your FREE copy right here! From Santa Maria della Vittoria, Langdon makes his way to Piazza Navona, Rome’s most famous piazza. Piazza Navona has been a gathering place for millennia. During the Roman Empire, a stadium was built on the site; the Stadium of Domitian became Rome’s premier venue for athletic competitions and, later, chariot races. Eventually the stadium fell out of use, and the city grew up around it. But as the popes reshaped Rome in the sixteenth and seventeenth centuries, they turned their sights on the stadium ruins, transforming the area into an elegant piazza. 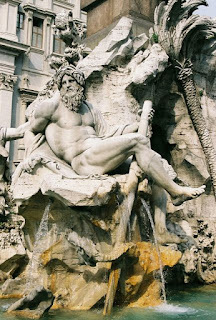 Bernini sculpted only the Danube; the other works were completed by artists in his workshop according to his designs. All the figures in the fountain shield their eyes from the sight of Borromini’s church—perhaps a slight against Bernini’s rival. And luck does not necessarily come to people who throw coins in the Fountain of the Four Rivers—that’s the Trevi Fountain, nearby. Check back here tomorrow for one more peek into Rome's Angels & Demons, my free guide for book and movie lovers everywhere! That's so beautiful--thanks for explaining that the statues have a deeper meaning--something someone like I would otherwise miss! Thanks for the snippet. I'm looking forward to read your ebook! I almost can't believe you're giving it away for free. Thanks for a great read and interesting blog - looking forward to more!